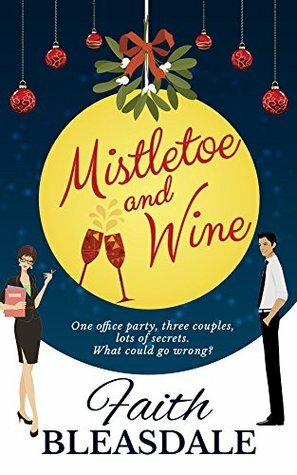 One office party, three couples, lots of secrets. What could possibly go wrong? Harry Augustus, the third generation boss of Augustus Estate Agents, is hosting the biggest and best Christmas party yet. He is pulling out all the stops and has a big announcement to make. Gabby, the glamorous office manager, is in charge of the festive bash. But she’s also sleeping with the boss. Their office romance has been anything but subtle and is made more scandalous by the fact that Harry is married with two kids. Caroline, Harry’s dutiful PA, is dating her irresistible colleague, Rob Sharp, who wants to keep their relationship private so it won’t affect his chances of an upcoming promotion. But Caroline is at her wits end; she’d rather face the inevitable gossip than the icy front Rob puts on in the office. Why does she feel like she’s the one having the affair? Gabby takes Caroline for a drink at the ‘Olive’ to plan the party and tells her she thinks Harry is going to leave his wife for her. That’s what the announcement is going to be about. While leaving the bar, Gabby sees Evie and Joseph, two juniors at the company, sharing a tender moment. As Gabby, Caroline and Evie grow closer, their secret relationships threaten to catch up with them. What is Harry’s speech going to be about? How will the couples cope when the truth is revealed during a not so secret ‘Secret Santa’ present swap? Can mistletoe and wine save the day? Mistletoe and Wine by Faith Bleasdale is labled as a romance novella but I’d probably toss it more into the contemporary pile and really read it as more comedy than romance. Quite honestly if it weren’t for laughing at these characters I’d probably be giving this one a star or two less. The novella is only a hundred pages long and spends most of it’s time building the character relationships leading up to their office Christmas party. These “relationships” are the feel sorry for the gal if not just dislike her types. Gabby is the bosses mistress, Caroline is the office jerk’s secret fling and only a step up above being a mistress because he’s single but single and looking which leads to Evie, the only that catches Caroline’s man’s eye. Thankfully after wading through these terrible set ups for what must be considered “romance” in someone’s eyes the end is a bit better than what I was expecting. So as you can tell I’m not a fan of the whole hidden relationship due to cheating thing and ended up giving this one 2.5 stars which is kind of a shame because the author had a decent enough writing style. Thanks for thee honest review Carrie. It’s too bad. This sounded so good and I like the cover. Oh I know, they failed to mention all the sneaking around and not actual “real” relationships. Great review. I hope the next one is fab. And I am sure it will be.